This article appears in The New Indian Express on the 14th of November, 2010. 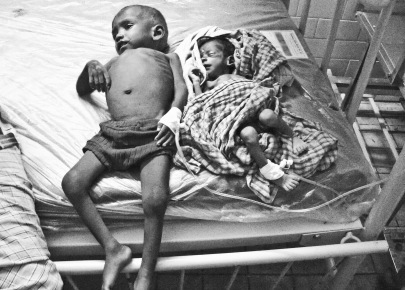 On the 25th of October, 8 malnurioushed children were refused treatment by the Nutrition and Rehabilitation Center in Badrachalam, Khammam District in Andhra Pradesh. All eight were children of Internally Displaced Persons from Dantewada/Bijapur District of Chhattisgarh. Apparently, the Project Officer of the Integrated Tribal Development Authority of Badrachalam, on the behest of the visiting Schedule Tribe Committee (consisting of MLAs from Congress, Telegu Desam Party and CPI-M), had passed a written order to stop treatment to ‘non-tribes’ and ‘non-BPL’ families. Strangely enough, the Gotti Koya, or the Muria from Dantewada/Bijapur District, who’ve had to flee the burning of their villages by the Salwa Judum and the police, and the threat of Maoist violence, fall into this criteria, simply as they have no documentation to prove that they are tribals or BPL families. Let us also put this into context. On the 23rd of September, a young couple Madvi Nanda and his wife Chukki had approached a mobile health clinic of an NGO. 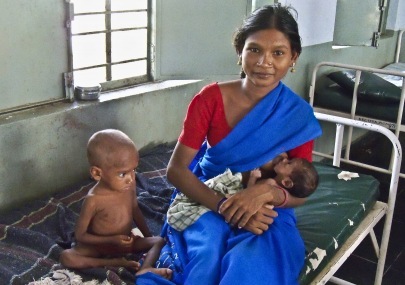 Their ten day-old infant stopped taking his mother’s milk, and another son Budra looked severely anaemic (see photos). They were IDPs from Chhattisgarh, village Duled in Konta block. Madvi Nanda said to have come to Khammam district of Andhra Pradesh to escape the threats and violence of the Salwa Judum. Previously, they were landowners of around twenty acres, but in Khamman, they have had to subsist doing manual labour in the ‘mirrchi’ fields, tendu patta and cotton fields, for Rs.60 a day. When Chukki got pregnant, it had become difficult for her to work, and thus the wages that came into a house without ration cards or any form of subsistence, reduced by half. Hunger and malnutrition soon followed. The entire family was then taken to the hospital where, after four days of treatment they were referred to the Nutrition and Rehabilitation Centre, run by the ITDA at Badrachalam. At the NRC, it was found that the youngest son, now 15 days old, wieghed only 1.5 kilograms, and the second son Budra, around three years old, weighed only 4.8 kilograms. 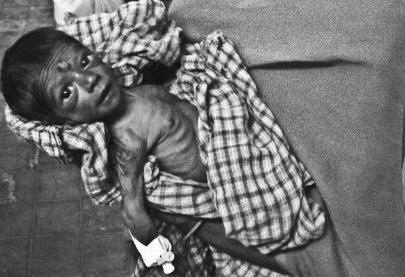 They were both classified as Grade four malnourished, and treatment began immediately. All four, the mother and her three sons were given three meals a day along with medicines till the 12th of October. They were then discharged when their condition normalized (see photos). The NRC then recommended a diet of milk, mutton, vegetables, green leaves, fruits, etc, for three months to help improve their health condition. Then of course, at the behest of the Tribal Welfare Ministry, the ITDA passes a note that ensures the Muria/Gotti Koya from Chhattisgarh, can’t find a single meal at the Nutrition and Rehabilitation Centre of Badrachalam. P Balaraju, the chairman of the Scheduled Tribe Committee, whose recommendations to the ITDA ensured that the Gotti Koya’s hungriest remain hungry, is also the Minister for Tribal Welfare, Andhra Pradesh. 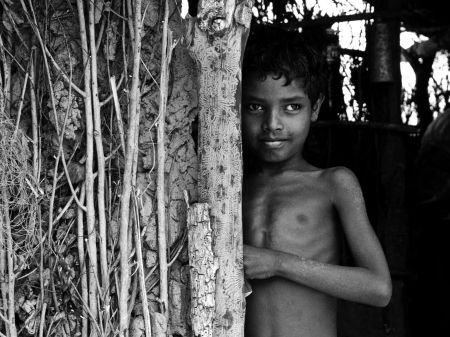 The Internally displaced persons from Chhattisgarh are in perpetual limbo. They’re occasionally pitted against the local adivasi tribes of Andhra Pradesh over minimal resources and no state government whether Andhra Pradesh, nor Chhattisgarh is willing to take responsibility for them. At the same time, no civil government department is capable of undermining the arm-twisting policies of the Andhra Pradesh Forest Department that wishes to send them back to Chhattisgarh, who would probably dump them in mismanaged Salwa Judum camps. Previously in the scorching summer, the 203 IDP settlements, with over 16,000 IDPs had to survive under draught-like conditions that were more man-made, specifically, Forest Department-made, as the Forest Department ensured no handpumps could be installed in the settlements whose natural sources of water had dried up in the beginning of the summer. In 2007, the late civil rights lawyer Balagopal had filed three Writ Petitions on behalf of numerous families of the Gotti Koya, and had managed to get a stay order on the demolition of their homes by the Forest Department. Yet the Forest Department continued to break down IDP settlements in other parts of Khammam, specifically in the summer season. They even argued in the High Court against the stay order, stating that the Gotti Koya should claim their rights to livelihood and to life in Chhattisgarh and not Andhra Pradesh; that they are a threat to the local population and that they do extensive damage to the forests. Recently, Justice CV Ramulu dismissed the vacate stay petitions filed by the Forest Department and upheld the rights of the tribals to live in the reserved forests. Yet let us take the Forest Department’s motive to protect the forests. They claim they need to protect the forests from slash-and-burn cultivation of the Gotti Koya, which has even been contested as an exaggerated claim. And yes, there is very little doubt that the Gotti Koya/Muria have done some damage to the forests in Khammam. And there is even lesser doubt that they’re not managing higher yields from the amount of land they ‘secretly’ cultivate. The land they cultivate lacks irrigation facilities, and they don’t manage too much produce, in comparison to the irrigated land cultivated by the Reddys or the Koyas. ‘One acre and the Muria will have just about 2-3 bags, and I’ve seen Reddys manage 30 bags of rice out of one acre.’ says a local social worker in Khammam. One wonders how the Muria would be, if he was allowed just a few acres of irrigated land, to support and feed his own family. Yet if he can’t even do that, why is the ‘Intergrated Tribal Development Authority’ ensuring that his malnutritioned children starve? Yet there is no right to the Reserve Forest given to the Gotti Koya/Muria at all. Not even one acre. And even local Koya tribals and older Muria tribals, living on non-reserve forest are preyed on by ‘promises’ of the legal deed – the patta.In the village of Amdalpeta in Chintur Mandal of Khammam, two non-tribals had taken Rs.300 from every family and promised them pattas. And the exploited of Amdalpeta themselves spoke of another case, where a lawyer managed to take Rs.2,00,00 from the tribals for a patta. There are countless cases of exploitation over legality, and right to land. How many times villagers are exploited with promises of pattas (deeds), one will never know. ‘You have to either save the tribal, or save the forest.’ I was told by a DFO dealing with extensive deforestation by the Gotti Koya in Khammam district. The answer is obvious. The Adivasi – the Santhals, the Kondhs, the Murias, the Koyas, the Baiga themselves weren’t ever consulted when the British laid the foundations of a law that would divorce them from their forests. It is difficult to believe that the forests ‘need to being protected’ from the tribals whose livelihoods, cultures and homes depend upon, when mining companies and corporations run amok in the jungle. Since 1980, the Ministry of Environment and Forests granted 34,527 hectares of the forest in 317 mining leases till 1997, and 60,476 hectares of the forest in 881 mining leases during 1997-2005. Environment Minister Jairam Ramesh may try his best to protect the forests and the odds are against him, yet who is protecting the tribal from exploiters and the Forest Department? The Naxalites? The Home minister? Or the Tribal Welfare Minister’s team whose recommendations ensure that the Muria from Chhattigarh aren’t tribals nor poor because they can’t prove it?